Accelerated Reader (AR) is a computer program that will help to develop your child’s independent reading. It works in quite a simple way; your child will pick a book at their own level, and when finished they will take a short quiz on a laptop or iPad in school. If your child passes the quiz about what they have read then this tells us that they have fully understood the content of the book. By passing the quiz they will also gain ‘points’ depending on the difficulty/length of the book they read. Each term children in KS2 (and year 2 when ready) take a test on a computer or tablet called STAR Reading. The test uses multiple-choice timed questions to determine a child's reading level. Questions in STAR reading adjust to a child's responses so if they respond correctly, the difficulty increases and if they answer incorrectly, the difficulty level is reduced. When a child has completed the test their teacher can find out their 'Zone of Proximal Development (ZPD). This will be given to each child on a book mark. 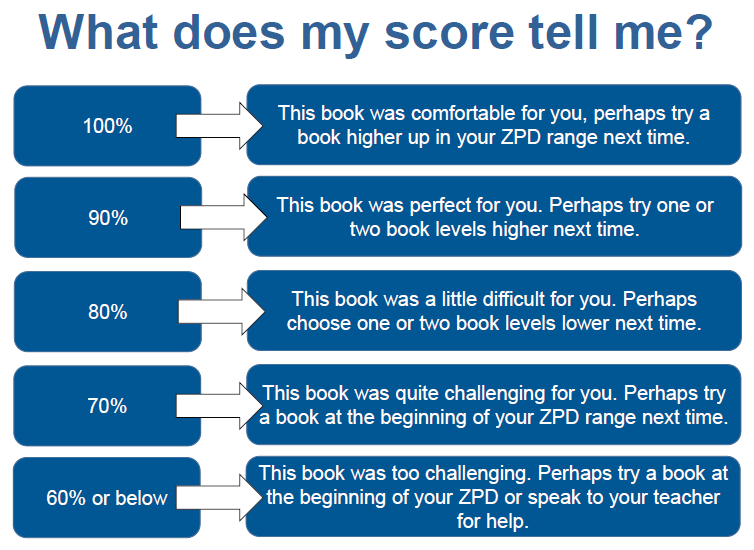 At Longstone we call the Zone of Proximal Development (ZPD) the book level range. This is the range of books that will challenge a child without causing frustration or loss of motivation. Books that have a quiz on AR are given a 'book level' which represent the difficulty of the text. 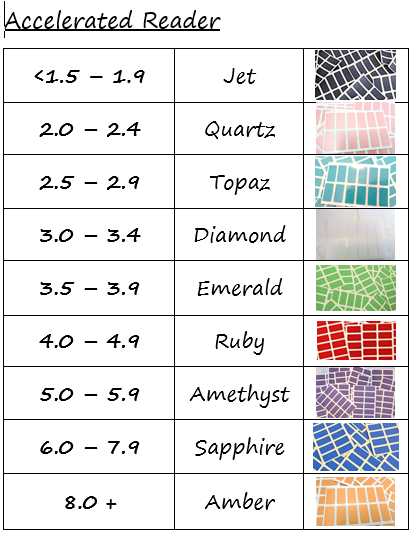 Book levels range from 0.5-13.5. Children should choose books within their range to make the most progress in their reading. 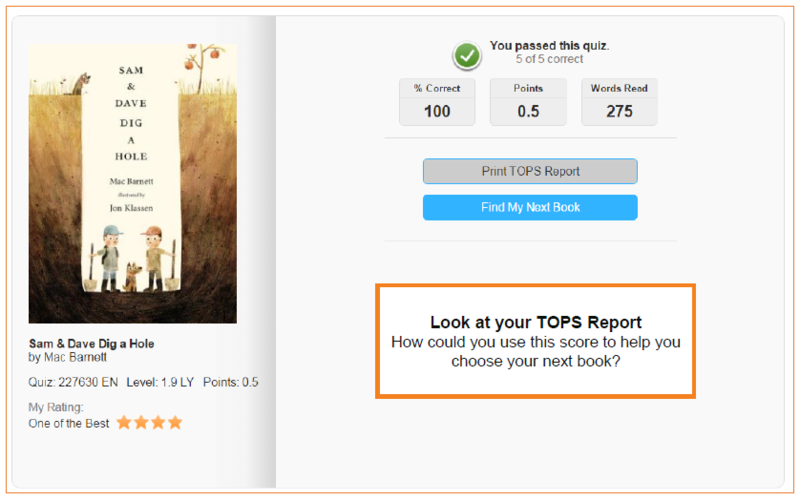 Every book that has an AR Reading Practice Quiz is given a points value. AR points are based on the length of the book (number of words). Pupils earn a percentage of points according to how well they pass the quiz. The Interest Level indicates for which age group a book is suitable for. It does this based on the content and themes. As mentioned above, children take a quiz once they have finished their book. It is important that children take their quiz as soon as possible after finishing their book (no more that a week later!) as this can affect their scores. Once they have finished their quiz children can immediately see if they have passed. If they pass they can review their incorrect answers. To make it easier to identify which gem books at school have a quiz they have been labelled on their spines with a coloured sticker. This sticker gives an idea of the book level. The book's quiz number, book level, points and interest level are either found on the inside front cover or the spine of the book. Children can check if a book has a new quiz or if a book from home has a quiz by searching for it on the AR Book Finder website. The advanced search on the website is also really useful for finding further books in a specific range. If you find a favourite book without a quiz you can suggest a book to be quizzed by filling in this form.